Fearing that Chief Minister Manohar Parrikar may dissolve the Assembly, the Opposition has once again written to Goa Governor Mridula Sinha reminding her of 2002 when the former had resorted to a similar act in a “manipulative’ way by keeping his cabinet in the dark. Addressing the press on the issue, Congress State President Girish Chodankar said that the Congress was willing to form the government and even though the party did not have the numbers, it was in talks with people from within the government - the BJP and its alliance partners -- who were dissatisfied with the way things were panning out. “There are disgruntled elements in the government. There are many who are unhappy, but the CM is not listening to anyone,” said Chodankar, who appeared confident that the party would be able to get the numbers. He also stated that while these unhappy voices expressed their unhappiness off the record, they sang a different tune to the media and Parrikar was well aware of this. Chodankar said that dissolution of the government and re-elections would mean unnecessary expense and trouble to the people of the State. “Why should there be a re-election when the people’s mandate is already clear? Even though the Congress had more MLAs than the BJP, the Governor never called us to form the government. We urge her to do so now,” said the Congress strongman. Chodankar was also adamant that while inviting other MLAs to help them form the government, the Congress would work with only those MLAs who had the best interests of Goa at heart. 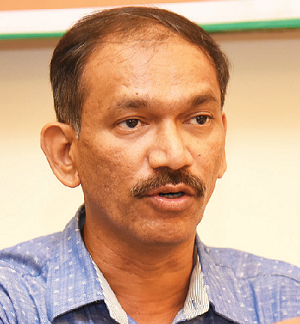 “We don’t want those who are trying to destroy Goa,” said Chodankar, specifically ruling out those MLAs involved in River Nationalisation, Mopa, and amendments to the TCP Act.